Our Government is broken at almost every level from small cities to the United States itself. The core reason for this is that we no longer have adequate representation in the legislative bodies of Government. The goal of this Blog is to illustrate the problem as it exists and bring the issue out into the open and educate people on the issue of representation as it is well hidden. The effects of poor representation are all around us. To illustrate this issue, the following three charts demonstrate the problem. 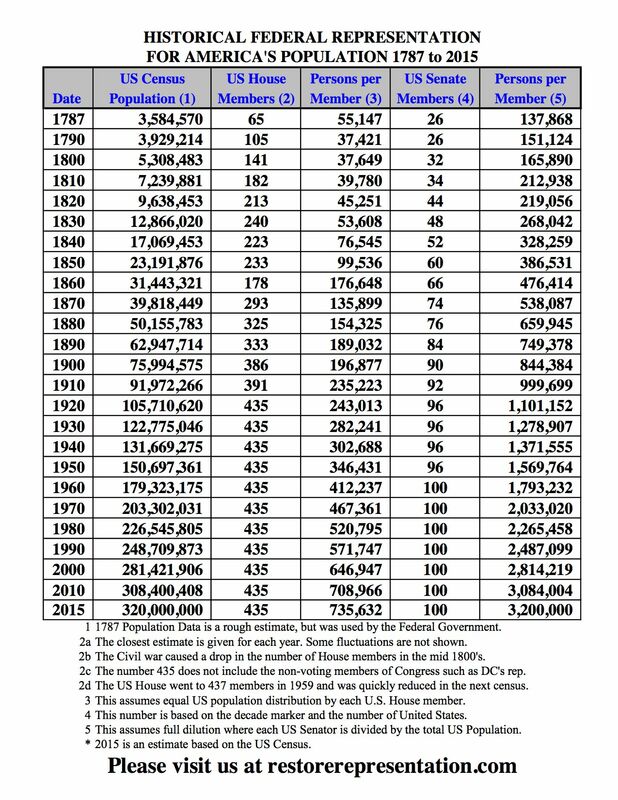 The first chart shows how Federal representation has decreased by capping representation as the total population continues to increase. The second set of charts shows representation in our state House and Senate chambers, which follows an identical trend. Lower Chambers are of particular importance. They are where the common citizen is supposed to have access. There is a wide spectrum of representation between the States as you can see by the chart. When we look at the average representation in New Hampshire, we see that each representative has just above 3,000 people per representative. In California , the number is closer to half a million. What do you think is proper? Where would you have better access? 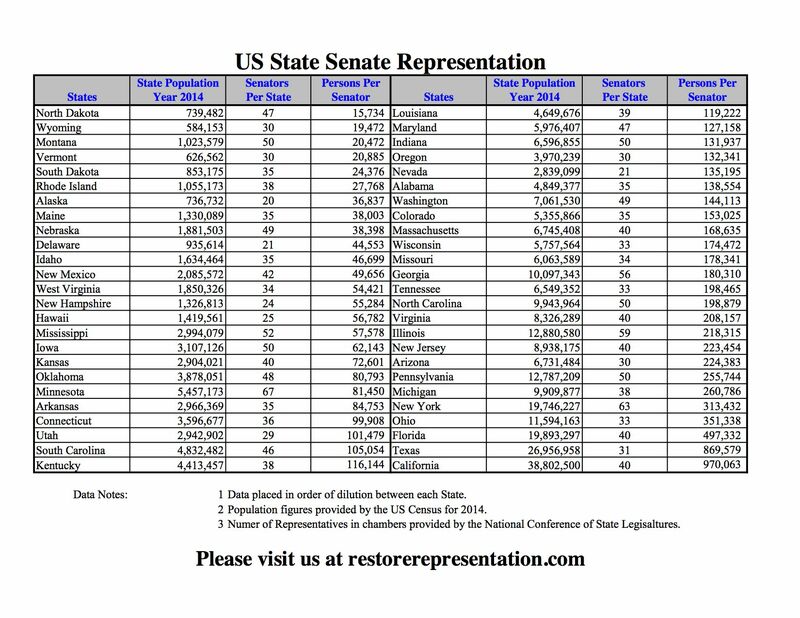 The Senate Representation chart is interesting. We can see also a vast array of representation. We see that North Dakota has the smallest districts and that once again, California has the largest districts with close to 1 million people. Historically Senate chambers were smaller than the House Chambers. They tended to directly represent Cities or Counties. When Reynolds v. Sims was decided in 1964, American Senates tended not to follow population, but instead they tended to represent Counties, much like how the US Senate is chosen by each State and not by equal populations. The last chart shows what representation was across the colonies at the founding of our country. This is a special chart and it took some time to collect all of the data for it. It shows what the representation was when the first 13 colonies were formed. 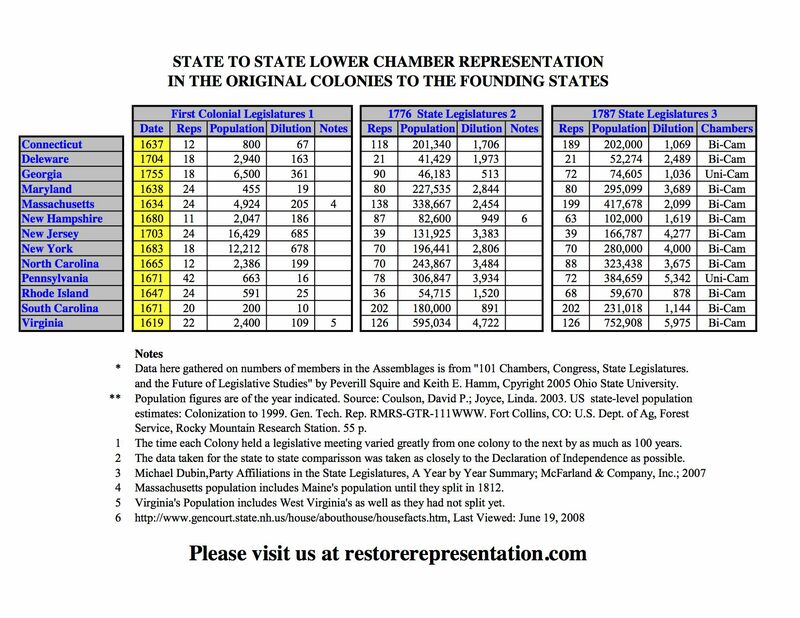 Then it shows the representation as the population progressed in 1776 and then what the lower chamber representation was when the US Constitution was signed. The reader should compare these figures to our modern figures. Do consider what the differences in society might be when there are varying numbers of people and different levels of representation between them. The great Thomas Paine also noted in book “Common Sense” that as the population grows, so do the number of representatives. I believe that most of the states have inadequate representation. 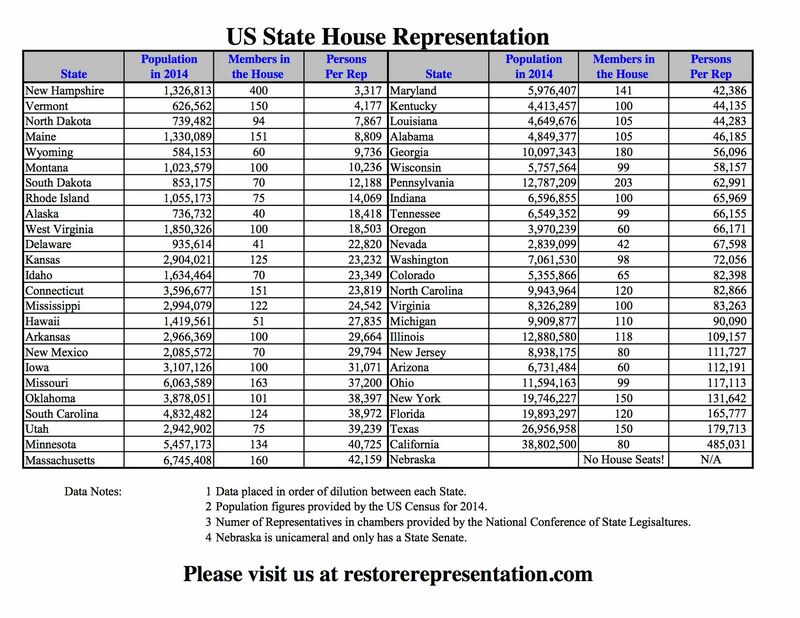 When the districts get above 10,000 the common citizen does not have access to his representative. His vote becomes diminished and the representatives no longer have the agency to those they represent. In fact, it becomes quite easy for the representative to become “captured” by special interests. Take a close look at these charts to see how representation has evolved. Consider this issue as many of you looking at this have likely never seen these facts or figures. We ask you to think about this issue and how it might affect the greater world. Our belief is, it does! Do you Feel Invisible to your Representatives?